That being said, I have started to eat fish once in a while by choice 😛 This time I had some guests coming over at my place and I thought why not make something little different than the usual style of preparation. So I tried my version of Goan(Goa is a coastal state in my country) preparation. And it turned out good. I am going to be making it more often. 1. Clean, wash and cut the fish fillets into medium size pieces. One fillet can be cut into 5-6 pieces. Now marinate the fish with 1/4 tsp turmeric powder, 1/4 tsp chilli powder and little bit of salt(as per your taste). Keep the marinated fish in the refrigerator for about an hour atleast. 2. Heat 2 tbsp oil in a pan. Shallow fry the marinated fish till it starts becoming golden in color. You will have to fry it for approximately 2-3 mins on medium flame on either sides. Don’t fry the fish for too long. Keep aside for using later(keep on a kitchen towel to take out the extra oil). 3. Heat 2 tbsp oil in a sauce pan. When the oil is heated, put the mustard seeds. Wait for the mustard seeds to splutter and then add cumin seeds and the fenugreek seeds. 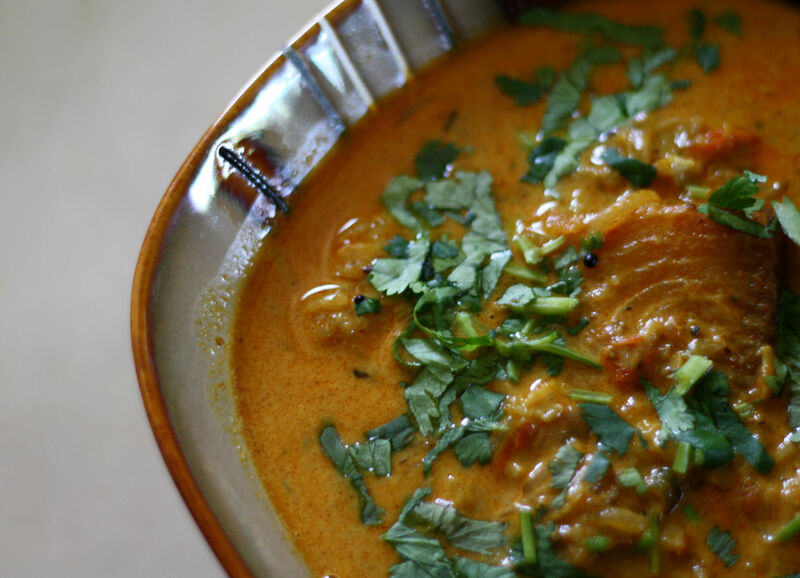 Once cumin seeds and fenugreek seeds become light brown, add curry leaves. 4. Immediately add, crushed ginger and garlic(For those who do not know what crushed ginger/garlic is, basically use a mortar and pestle to crush ginger and garlic. Alternatively, you could you ginger garlic paste. But the crushed version tastes better). Once it becomes golden brown, add the sliced shallots and green chillies(either slit into 2 halves or sliced). 5. Add salt at this point. Adding salt with the onions has an advantage. It quickens the process of frying the onion by taking the moisture content in the onion. Saute for about 4-5 mins till onion is fried till it turns light pink. 6. Add the remaining turmeric powder, red chilli powder, coriander powder and garam masala and saute. Fry till the spices are cooked well( You would know the spices are done, when the oil starts to separate from the mixture. Alternately you could wait till the onion starts becoming slightly crispy in appearance). 7. Add chopped tomato and lime juice and wait till the tomatoes are done well. The tomato will kind of dissolve when its cooked thoroughly. 8. Now lower the flame medium-low and pour the coconut milk. I use the coconut milk concentrate. So you can add water along with it to bring it to the consistency you would prefer the gravy to be. I do not like the gravy to be too thick. So I added about 1 cup water. 9. Let it boil. Remember to keep stirring the gravy often else the coconut milk will split. The gravy would take some time to come to boil since you are cooking in medium low flame. 10. Once it begins to boil, add the fish pieces to the gravy. Since the fish is fried, it is almost cooked already. So boil it for 3-4 mins more and it is ready. 11. Garnish with chopped coriander leaves. Serve with hot rice. 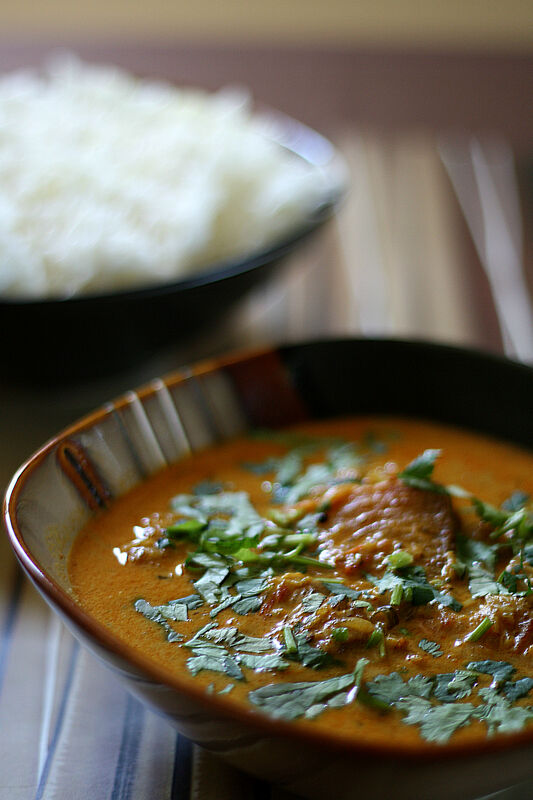 This entry was posted in Gravy 'N' Semi Gravy varieties, Specialities-Seafood and tagged fish curry, Fish curry using coconut milk, Goan fish curry recipe, Goan style fish gravy. Bookmark the permalink.